It's mild here in western Mass, which is nice. It's also a little gray and drizzly. But that's okay. Because it's mild. And I am here. And good things happen. "Mel’s novella captures perfectly the sweetness and the sourness of young long-distance love, the awe found in beginnings mixed with the solemn dreams of endings, and mixes them together as only a gifted but also an exceptionally big-hearted writer could. It’s the mix of craft and just a little bit of gut-punch, of head and heart, that make this one such a winning little story." Read her entire review HERE. Wowie. 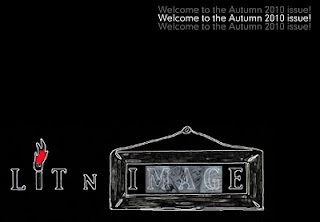 And LITnIMAGE brings the autumn goodness with their new issue. Check out new work from Garrett Socol, Michelle Reale, Gay Degani, and more.